On May 5th 2018, Warren Buffett said Bitcoin was probably, “rat poison squared”. This post chronicles some of the negative things both Warren Buffett and Charlie Munger have said about cryptocurrencies and Bitcoin. Here, Munger first calls Bitcoin rat poison. Here, 5 years later, Buffett doubles down and calls Bitcoin, “rat poison squared”. When asked about Bitcoin during Berkshire’s 2018 annual meeting, Warren Buffet rambles on for a bit and then Charlie Munger compares it to “trading turds” (shown in clip above). After the 2018 annual meeting, Charlie continues his slamming of Bitcoin and compares it to trading, “freshly harvested baby brains”. I found Max Keiser’s response to the rat poison comments quite funny. 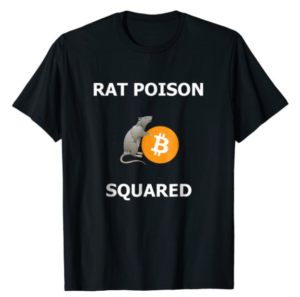 He said, “bitcoin IS rat poison and the banks are the rat”. Here’s an image of the shirt I made about Bitcoin being called rat poison squared. You can buy it here.